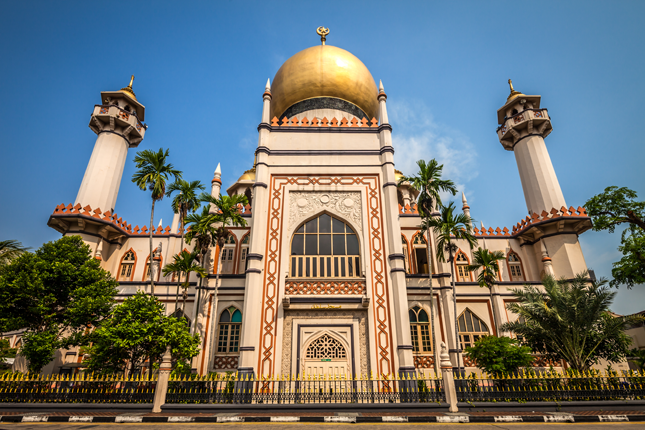 Formerly the royal mosque of the Sultan of Johor, Sultan Mosque represents the solidarity and unity of Muslims in Singapore. 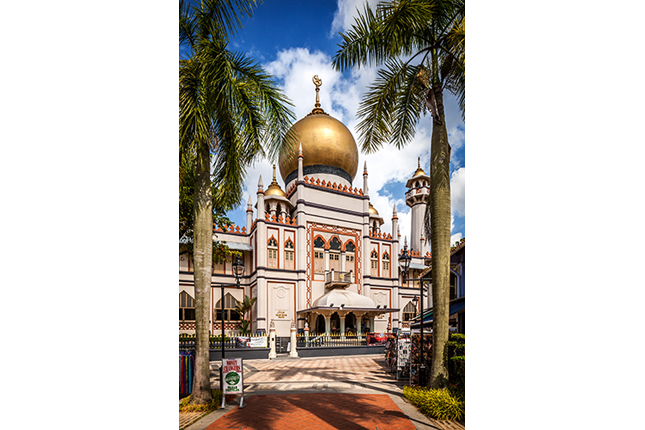 The impressive building serves as a reminder of the Malay royalty that was once housed in the nearby Istana Kampong Glam and the thriving Muslim communities living in the area during the British colonial period. In 1824, Sultan Hussein Shah of Johor signed an agreement with the British East India Company (EIC), which effectively ceded Singapore to the latter for the establishment of a British trading port on the island. The British agreed to pay an annual stipend to the Sultan and his descendants, and to recognise Kampong Glam as the royal family’s asset. In addition, a parcel of land was set aside for a royal mosque near Istana Kampong Glam, then the residence of the Sultan of Johor. Sir Stamford Raffles later pledged a contribution of 3,000 Spanish dollars from the EIC to the royal mosque’s building fund. The original mosque was a single-storey brick structure with a two-tiered pitched roof, an architectural feature typical of traditional Southeast Asian mosques. By 1924, it had become clear that the century-old structure was in dire need of repairs. The trustees of the mosque then approved the construction of a larger mosque on the site. Irish architect Denis Santry from the local architectural firm Swan & Maclaren was commissioned for the project; he also designed the Cenotaph, Telok Ayer Chinese Methodist Church, and Former Tanjong Pagar Railway Station. The work was done in phases as fundraising was started in 1924 and partly to avoid disrupting the use of the mosque by worshippers. However, these were the years leading to the global recession, and fundraising became increasingly difficult. From 1926 to 1927, no funds were raised. 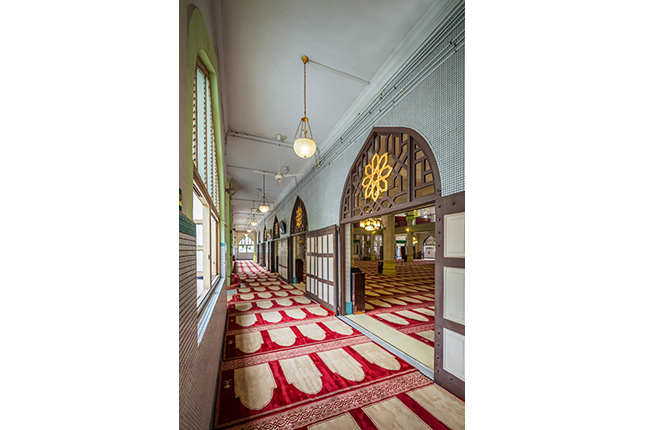 However, in 1928, the mosque started its fundraising efforts again and building works commenced that same year. Muslims from the various ethnic communities in Singapore donated generously to the building project. Finally, by 26 February 1932, the reconstruction of the mosque was completed with only minor works left to be done. The iron and brick wall enclosing the mosque was to be completed by the end of the year. In the past, Sultan Mosque also served as a stopover for Muslim pilgrims from the region on their hajj (pilgrimage to the Islamic holy city of Mecca). 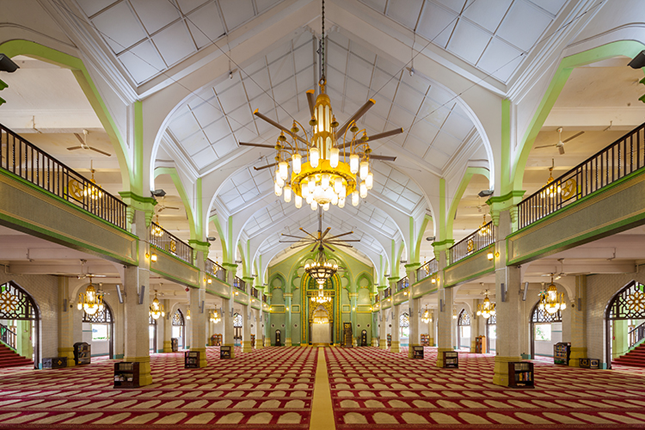 Like those of many other mosques in Singapore at that time, such as Hajjah Fatimah Mosque, Sultan Mosque’s design was heavily influenced by the Indo-Saracenic style. This style combines traditional Indian and Islamic elements with European architectural features. The mosque is fenced off from the surroundings by a low boundary wall of cast-iron railings. Its front and back façades (facing Muscat Street and North Bridge Road respectively) are covered in exquisite arabesque mouldings. Beautiful Islamic merlon cresting lines the perimeters of the roof parapet, only to be broken by miniature minaret-like structures at regular intervals. The mosque is easily recognisable by its two large, golden ogee-shaped (onion-shaped) domes atop the eastern and western ends of the prayer hall: one dome caps the main entrance foyer, while the other crowns the splendid mausoleum where Sultan Alauddin Alam Shah (the grandson of Sultan Hussein Shah) and other members of the royal family are buried. Flanked by Mogul-inspired cupolas, each dome is topped by a crescent moon and a star - symbols that are often associated with Islam. Encircling the base of each dome is a belt of glass bottles, which were collected and donated by the poor as their contributions to the mosque’s construction. Rectangular in plan, the main prayer hall is skewed to align with the qibla, the orientation to the Islamic holy city of Mecca. The two-storey hall can hold up to 5,000 worshippers. The mihrab, a deeply recessed niche on a wall inside the prayer hall that indicates the direction of Mecca, is framed by a lancet-shaped arch and adorned with remarkable arabesque scroll motifs, leaves, flowers, curling tendrils, and classical vines. Numerous windows on both levels allow the interior to be well ventilated. On the ground floor, the ogee-shaped windows have three distinct sections: louvred timber shutters on top, casement windows in the middle, and patterned vents at the bottom. The fenestration on the second floor comprises various shapes and styles, including cinquefoil windows with ornate mouldings. In 1993, an annex building of similar architectural design was added to the existing edifice. As per tradition, the official start of Ramadan – the Muslim fasting month – is announced every year at Sultan Mosque. During Ramadan, the vicinity around the mosque is transformed into a bazaar. Sultan Mosque is currently under the jurisdiction of the Islamic Religious Council of Singapore (Majlis Ugama Islam Singapura, MUIS).